Akita is a modern, business theme that comes with all the awesomeness you’d expect from a theme built on the Theme Blvd Framework. 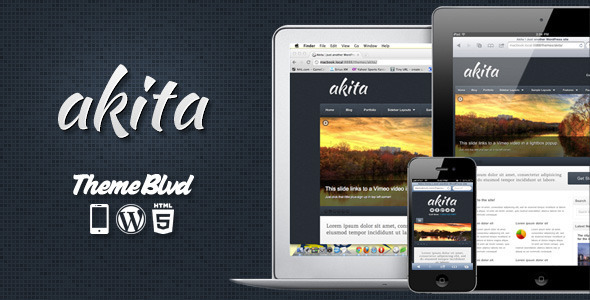 Desgined for every device, and compatible with all exclusive Theme Blvd plugins, Akita will have your client’s site up and running in no time. Whether your website visitors are browsing from a Retina MacBook Pro, a Retina iPad, or any of the other high-resolution devices that inevitably will come onto the market, this theme has you covered. The theme’s stylesheets automatically check each website visiter’s device pixel-density ratio, and then serve up all of the theme’s details crafted for their specific resolution. The result is a graphically beautiful experience, no matter the device. The entire theme, all the way down through the Theme Blvd Framework at the core, has been carefully built around the modern era of responsive web design. No longer should we be concerned with specifically just the iPad or the iPhone, but we need to focus on the entire mobile and tablet experience, as a whole. That is the approach we take at Theme Blvd. 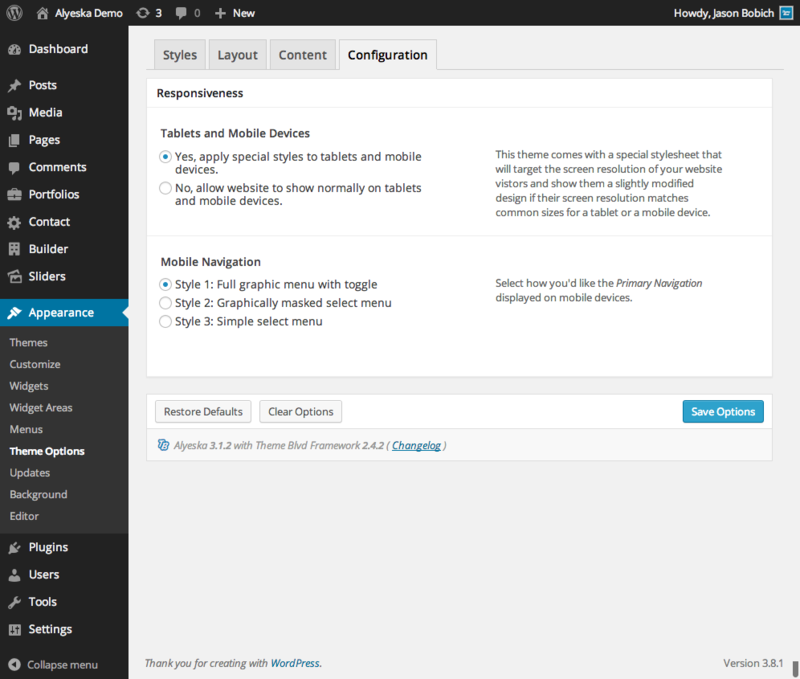 Make sure to view the theme’s live demo on your various devices and browse through all of the demonstrated features. With complete WordPress Customizer support, just the right amount of Theme Options, and logical default values, you’ll be sure to have a unique site that stands out above the rest, without having to sift through an endless abyss of configuration. First, decide if you want to a apply a boxed or stretched layout. Then, you can use our theme’s custom background control to pick any of our transparent textures to go along with a custom color of your choice from the color wheel. Or, maybe you’re wanting to use a custom background image? Head on over to Appearance > Background and use WordPress’s built-in background control to override the theme’s background options. From there, it’s time to checkout one of the features that subtly sets Akita’s design apart, and that is the textured block main navigation. Select from our 12 carefully crafted Primary Colors. This will determine the color of your main navigation along with the background of the “featured” area of your website’s homepage. And if you’re not a fan of Akita’s textured block-style menu, switch over to the “Classic” style menu, which is compatible with all 12 colors, as well. Go to Appearance > Widgets and add the “Search” widget to your new custom widget area along with the “Theme Blvd News Scroller” widget. Go to the Templates page and create a new custom template. Use “Akita Homepage” sample layout as your template’s starting point. Configure your element settings. This includes selecting your custom slider in the slider element, and selecting the custom widget area you created within the second column of the Columns element. Then, save the template. Go to Appearance > Theme Options > Content > Homepage, select to show a custom template, and select the template you’ve created. Listed here all of updates to this theme and when they were posted. In your WordPress admin panel, you can see what version of the theme you’re using by going to Appearance > Themes and looking at the version number next to the name of the theme.